Check out BRM's solution, they completely get rid of the chicken loop and bar hook http://boardridingmaui.com/cloud-connection-system.html. Most manufactures now offer shorter chicken loop sizes. I use Naish and converted my loops from the 30cm to 25cm loops, helps some. I think I'd like to convert my bar from a hook to a rope attached ring next, brings everything in a few more inches and gets rid of the lever effect on the bar. I understand trying to shorten chicken loop, but you say also that you don’t want to shorten lines....why wouldn’t you want to lengthen the backs or shorten the fronts to move the “sweet spot” closer to you? Most riders follow manufacturers recommendations and hook up lines with the “sweet spot” at arms length, Personally I shorten the fronts and/or lengthen the backs to bring the “sweet spot” to be a couple of inches from the bar. My short - armed wife uses the Slingshot Comp stick with the small chicken loop . i am also bar throw challenged. just adjusting the lines or increasing the depower range on the bar is fine, I did both of those. but the real problem with both of those solutions is that you have to constantly adjust the trim strap to stay in the sweep spot with changing wind, since you don't have the range of motion on the bar. 1: board short harness. get a harness that puts the hook as low as you get. 2: shorten the entire chicken loop assembly as much as you can. with the chicken loops you have, that means the loop. making new dyneema lines for DIY revsions is not so hard. i'm not familiar with the fittings on your loop, but chances are you can hack apart what you have and make your own. Think Slingshot Talon. >>i started with LF CPR and shortened the chicken loop. Then i did a complete rework and changed how the entire thing attached to the spreader. 3: get rid of the hook on your spreader. ropes in general are the way to go, but for short arms, they also all the check loop to slide to your hips, which also limits bar throw as they slide off center, espeically riding toe side down wind. try to limit the amount the chicken loop can move side to side on the rope. >> i highly modified a dakine pivoting hammerhead spreader. which IMO is nicer than using a rope, for me, because it keeps the attachment closer to my body, but still allows pivoting, and a little sliding. the end result is awesome. i can set my trim and ride entire sessions at the hood river sandbar without changing it. i can get thru the lulls with the bar close, and still make it thru the gusts without being over powered. if it were me and i had some money to spend, i would first get a dakine nitrous shorts, then retro fit one of your bars with a slingshot sentinel chichen, which they sell as a replacement + talon. you can buy all the parts you need thru windance. then get a rope spreader, and see how it goes. limit the side to side on the rope if you feel the need. if you are a more DIY type, don't be shy, tear into it and have fun. but ideally have a back out plan in case what you do doesn't work. You might want to try one of the board shorts harnesses like the Ion or Dakine. Some bars, though apparently not yours, come with chicken loop options. I taught kids to kite for years, and used the Slingshot system. It takes 60 seconds to swap out the loop. Works great. At 5'1" you may also want to adjust your trim. If your lines have multiple knots, connect such that the rears are longer than the fronts. Try 1" at a time until it feels right. 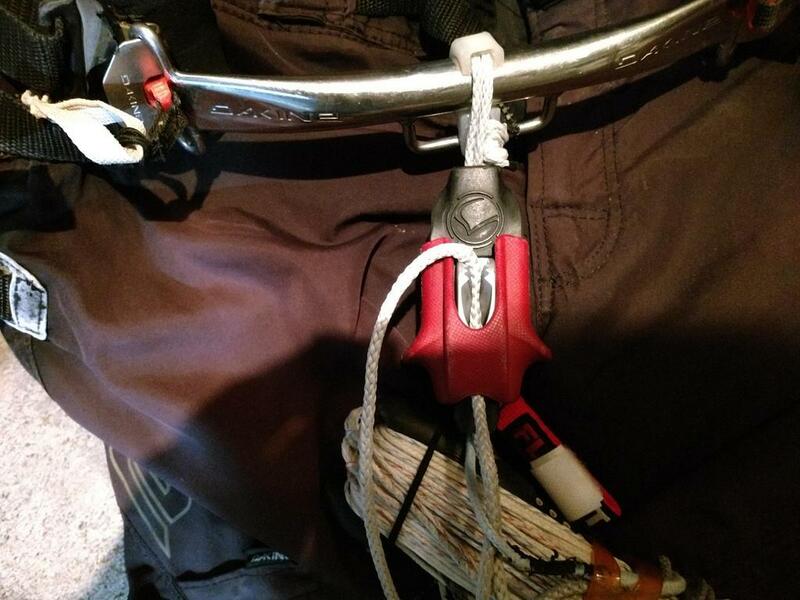 If you ride swell mostly, vs wakestyle, consider a sliding rope harness too. Not only does this pull the bar in about 2", you also avoid the hip strain of riding toe-side. Slingshot makes a connection--Talon--specifically for ropes too. And again, it's a one minute swap out. In the end, consider a bar that allows you to change how you hook in easily. Lots of used bars out there. I am not sure which manufacturers allow you to easily change all of this besides Slingshot, but I am sure several do. That said, with Slingshot you need one allen key and 60 seconds. To bring the "sweet spot" closer to you instead of " arms fully extended" you need to reduce wasted (or waisted) space between the bar and your belly button. To do this and to allow for maximum arm throw (de-power) I did three things. #1. Keep your hook very low on your body. Use harness shorts or seat harness. Make sure the hook can not pull away/far forward (anterior) or upwards from you pelvis. #2. Switch to a TIGHT slider rope instead of a fixed hook. #3. Switch to a small chicken loop or similar aftermarket bar accessory. Notice that modern chicken loops are stiff molded plastic. They do not distort or elongate under loads so they in effect are "smaller". Six years ago before small chicken loops I did this to a Naish chicken loop. It was made from braided line covered with a urethane tube. Basically, I cut both the line back and the cover tube. I then stitched and super glued the (now shortened) stitched end of the chicken loop. I then re-threaded the shortened urethane cover. See photo: The black colored micro loop is my custom retro-fit. 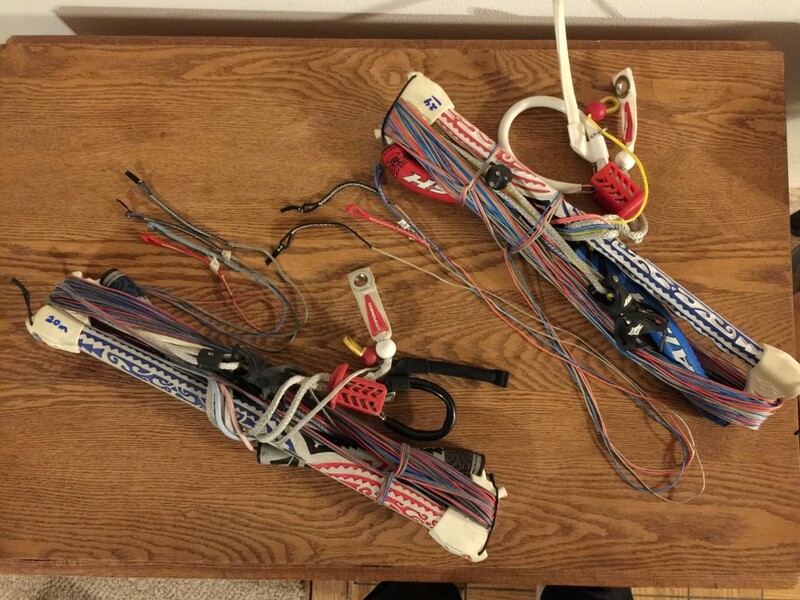 I am not sure which manufactures allow you to easily change all of this besides Slingshot, but I am sure several do. That said, with Slingshot you need one allen key and 60 seconds. Yup, same with the North slider rope chicken loop - works great!! here is a pic of my set up. fully sheeted in, I can put the bar at my belly button. I use the Slingshot chicken ball to limit the throw on my chicken line. Probably the cheapest option, can be adjusted until you find the right length, and should work with your existing bars. As others have mentioned, a small chicken loop helps if you need to be able to sheet in more; I run the small Slingshot chicken loop.